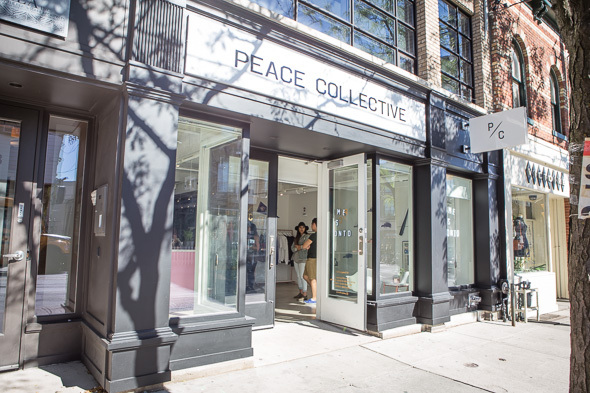 Peace Collective has a flagship store for their clothing brand at Ossington and Argyle. Well-known for their apparel featuring graphic tees with a minimal, mostly black-and-white colour story, the pride represented by the slogans on their shirts (such as the now-famous "Toronto Vs. Everybody") runs deep: Peace Collective is an offshoot of the Peace Foundation . This foundation partners with such local Canadian charities as Breakfast for Learning , so that a portion of proceeds from the purchase of certain clothing items go to, for example, providing school meals for kids. They also host events in the space with donations-based entry fees. The interior is big, white, blocky, and industrial. Black clothing racks and tables are set off by white walls. Dominating the front part of the space right near the entryway is in-store gourmet milkshake bar Peace Treats , and opposite that is a glowing sign reading "Home is Toronto," another one of their slogans, highlighting a seasonal apparel section. 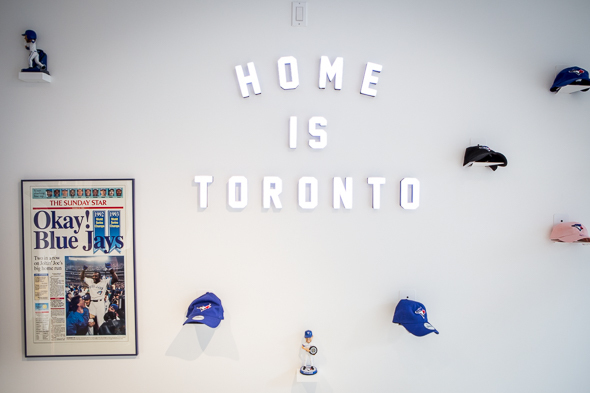 When we visited, it was the beginning of a Jays baseball season that debuted with a lot of hope left over from our last, more-successful-than-most season. The same "Toronto Vs. Everybody" slogan with familiar branding is still everywhere on these garments, but in the bright blue and white Jays colours with discreet Jays logos. Peace Collective is looking to rep Canadian pride without resorting to the typical Canadian stereotypes such as maple leaves and syrup. 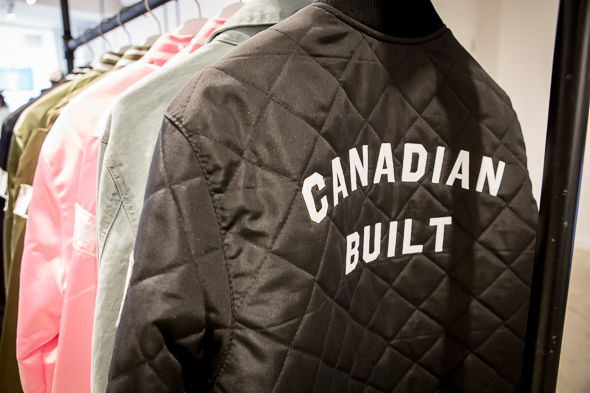 The streetwear without too much colour is designed to be easy for anyone with Torontonian pride to wear, and therefore participate in supporting their community. Tees aren't too pricey (about $29.99) but a jacket like this could set you back about $169.99. You can always go for a much cheaper tote ($18.99) or other accessories. Their hats are pretty pricey too, in about the $30 - $50 range, but spending a little more isn't so bad when the products are local and support charity, and the looks are fly. In addition to this flat brim cap, they stock other curved-brim caps and toques, for whatever weather or style. 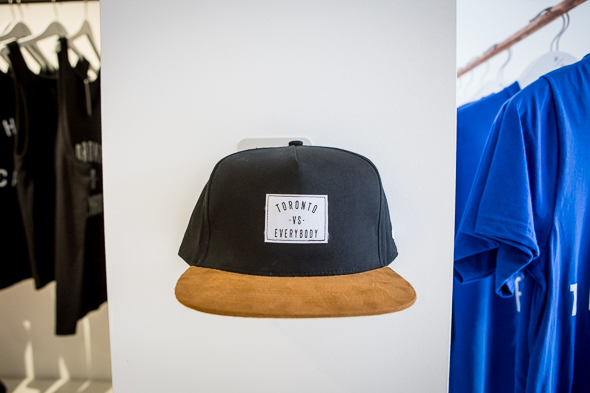 Peace Collective caters to even the littlest Torontonians, too, so you can match your baby in similarly badass streetwear with the same slogans as the adult apparel, or give the gift of Canadian pride. This cool black-and-white onesie and kids tee both go for $32.99. 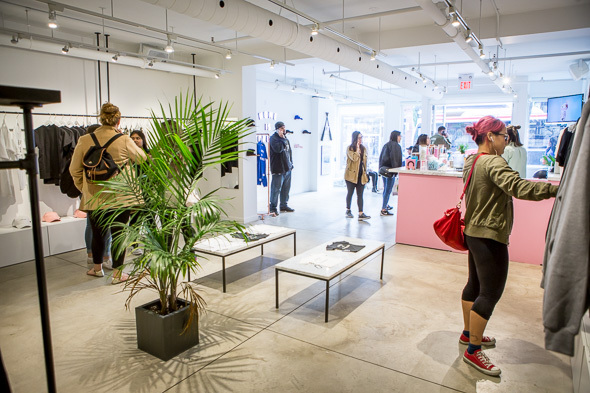 Everything in the store is designed to be pretty much unisex, though there is a small "women's" section that has some intimates and bamboo fabric tanks and tees made with a softer material in a slimmer build, though anyone could still buy them. Clothing is sorted more by colour than slogan or size, so dig for the perfect item!